Sishyas: chEmam jIyar, thirukkurugaip pirAn jIyar, sundhara pANdiya dhEvan, etc. This entry was posted in AchAryas before mAmunigaL on July 9, 2015 by Sarathy Thothathri. Sishyas: ashta dhik gajangaL – srI ranganAtha, ponnadikkAl jIyar, kOil aNNan, pathangi paravasthu pattarpirAn jIyar, thiruvEnkata jIyar, eRumbiappA, prathivAdhi bhayankaram aNNan, appiLLai, appiLLAr. nava rathnangaL – sEnai muthaliAndAn nAyanAr, satagOpa dhAsar (nAlUr siRRAththAn), kanthAdai pOrERRu nAyan, yEttUr singarAchAryar, kanthAdai aNNappan, kanthAdai thirukkOpurathu nAyanAr, kanthAdai nAraNappai, kanthAdai thOzhapparappai, kanthAdai azhaiththu vAzhviththa perumAL. He had many other sishyas from various thiruvamsams, thirumALigais and dhivya dhEsams. Works: prabhandhams: sri dhEvarAja mangaLam, yathirAja vimsathi, upadhEsa raththina mAlai, thiruvAimozhi nURRandhAthi, Arthi prabhandham. 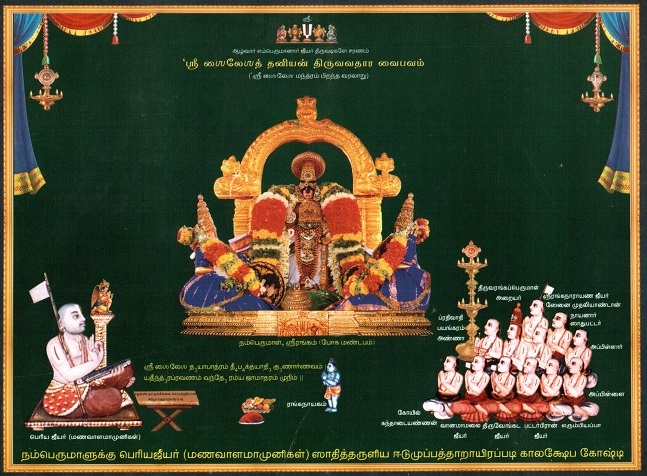 vyAkyAnams for: mumukshuppadi, thathva thrayam, srIvachana bhUshaNam, AchArya hrudhayam, periyAzhwAr thirumozhi (for the portion which was missing from periyavAchAn piLLai’s vyAkyAnam), rAmAnusa nURRandhAthi. pramANa thirattu (compilation of all slOkams, sAsthra vAkhyams in a particular gratham) for: eedu 36000 padi, gyAna sAram, pramEya sAram, thathva thrayam, srIvachana bhUshaNam. This entry was posted in AchAryas before mAmunigaL on July 1, 2015 by Sarathy Thothathri. sishyas: varadhAchariar (His own son) and brahmathanthra swathanthra jIyar. vEdhanthachAryar has written more than a hundred granthams, and they are in samskrutham, thamizh and maNipravALam (mixture of Sanskrit and Tamil). Following are some of the most important of his granthams. dhramidOpanishadh thAthparya rathnAvaLi, dhramidOpanishadh sAram, that provide meanings on thiruvAimozhi, and so on and more.